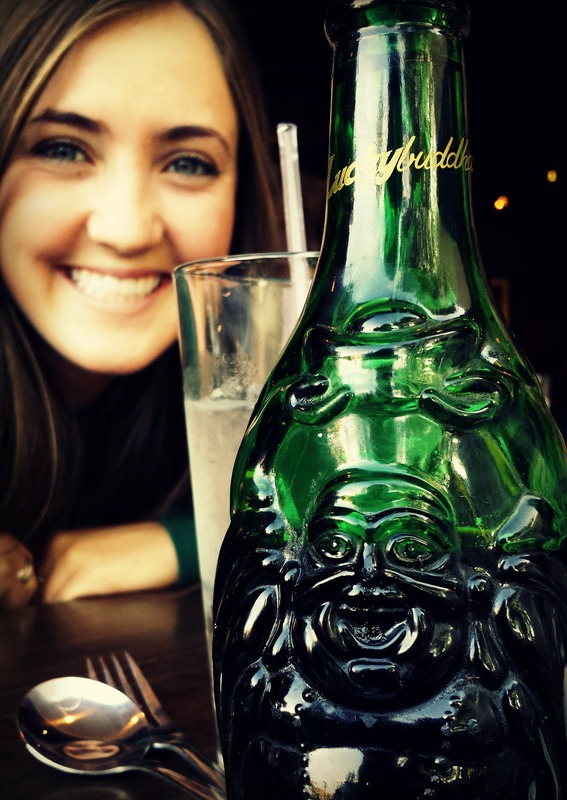 The week before the youngest Schrecklet went off to college we went to dinner at Little Ollies, one of our favorite Chinese restaurants in Cherry Creek. During dinner, the Schrecklet was telling me and my husband, The Captain (Kirk), about when she was here for homecoming and they all had “Buddha Buttons” after dinner. She tried to explain what a Buddha Button was. “It’s a small dried flower that when placed in your mouth makes you salivate, your mouth feels tingly and numb, and it will make you start to foam at the mouth. You then drink a shot glass of lemonade (or I’m sure any sweet or sour drink) for an explosion of craziness in your mouth.” Hmmm, I was intrigued. The Captain was not interested. Traveling from our home in Denver to Wichita, Kansas to see Kirk’s parents, is a very long and boring drive. Eight to nine hours of straight highway driving. 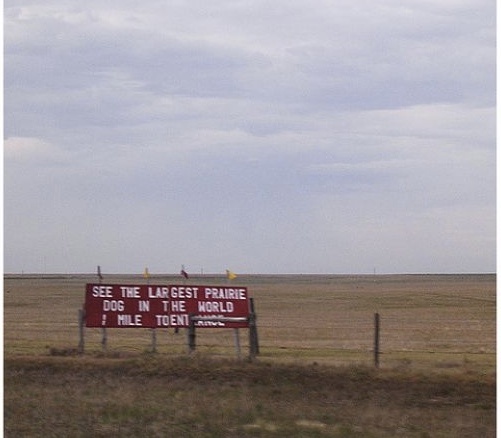 But somewhere about 10-20 miles east of the Kansas border you start seeing a series of signs reading “WORLD’S LARGEST PRAIRIE DOG” “PETTING ZOO” “COW WITH TWO HEADS” “RATTLESNAKES.” Like a freakshow from the 1920’s, I pictured pulling up and seeing a bearded lady selling tickets. Every time we passed by, the kids and I would always say we wanted to stop here to see the world’s largest prairie dog and the other freaky creatures. Of course, like most men, the Captain was on a mission to beat his last driving time on this same route, and he would convince us that these signs had been here on I-70 for over 50 years (actually since 1973) and there couldn’t possibly still be anything there, and we wouldn’t stop. The summer of 2011, we made four trips to Kansas, as my mother-in-law was very ill. We flew twice and drove twice. On the last trip back from Kansas to Denver, I insisted, “We are stopping to see the stinkin’ world’s largest prairie dog!” If I had to hitchhike the rest of the way home because I was the only one stopping, so be it. In the car, now cheering, was Jacob, our 26-year old son, Taylor, our 20-year-old daughter, and Bailey, our 15-year-old daughter. Our oldest son, Danny was working in California and couldn’t make the trip. Looking like a scene from a Chevy Chase, Griswald Family Vacation movie, we pulled off the highway and onto a dirt road that lead to “Prairie Dog Town” (yes, with a prairie dog so big, it required it’s own town)! 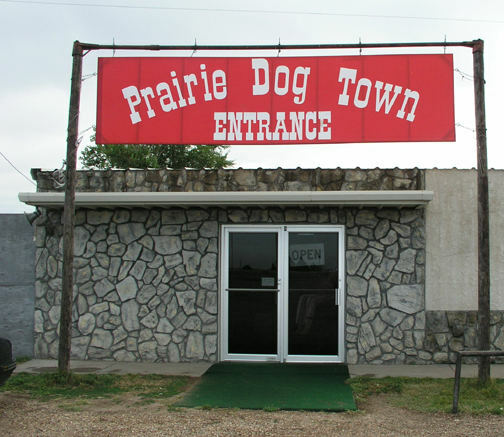 I will admit, that if my children need therapy later in life, it is from stopping at Prairie Dog Town on that trip. I still shudder thinking about the horrific sites we saw. There was a giant fenced yard of dirt and gravel. 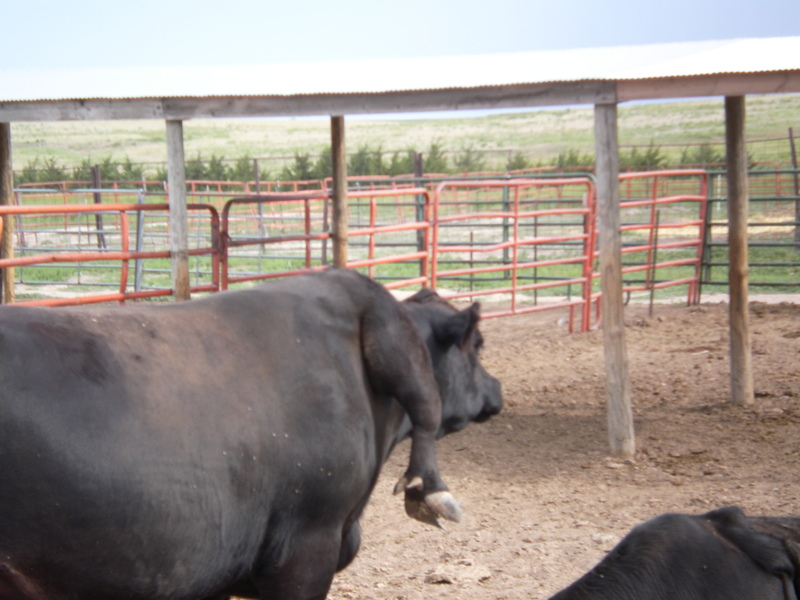 In the back, there were several small pens holding mutant animals, such as a three-legged coyote, a cow with six legs, a two-headed tortoise, a cage with hundreds of rattlesnakes and lots of little prairie dogs running around. I was only interested in finding the big one. The grand-daddy of the prairie dogs. 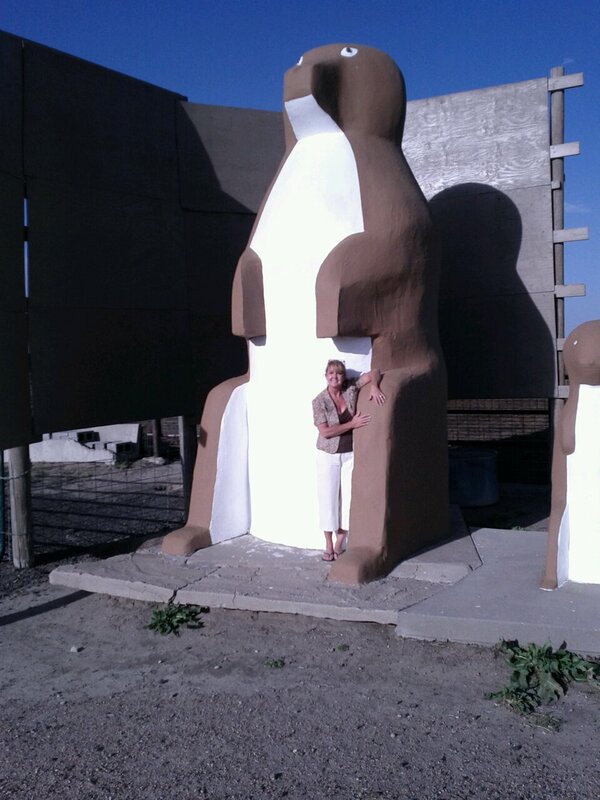 I went out and got my picture taken next to the World’s Largest Prairie Dog and we all loaded back into the car, laughing and totally creeped out by the whole experience. During the next four hours of our drive, I went into my motivational mom mode, telling the family, that in life, you have to take these detours, stopping and experiencing things like the world’s largest prairie dog, or seeing the largest ball of twine, or applying for that job that you feel you are under qualified for, or you will NEVER KNOW. You have to explore and take the scenic routes, or you will stay on the boring highways until it’s too late to take the detours. The Schrecklet and I laughed, recalling the story and then called the waitress over and ordered three Buddha Buttons. They were AWESOME! What have you done to venture off of life’s highways and see the wonderful detours? I’d love to hear your story!